Cenqua : The Commentator 是一個有趣的想法, 但是看他說明的時候請注意到網頁最下方, 有一行小小的字寫著 : "Promotion running only for April 1". 先假設有這樣的一個 tool 好了, 根據網頁上的文宣, 其實 The Commentator 主打的並非 automatic commentating, 而是 personalized automatic commentating. 在加上 comment 時, 是可以根據你個人的 commentating 習慣, 來產生 "看起來" 是你手動打出的 comments. 換句話說, 其實 The Commentator 是一個 Personalized Comment Decorator, 其前端還需要具有一個 Comment Add-on Suggester 來找出在程式碼的哪個部份會需要加上何種 comments, 形成一個 unified comments, 然後再利用 Personalized Comment Decorator 來對於該 comment 加上潤飾. 而 Personalized Comment Decorator 的潤飾其實是一種 view 的轉換. 如上圖, 利用一個 Comment Add-on Suggester 作為前端, 判斷要加上甚麼樣的 comment 內容, 在 source code 與 comment 之間作 logic (syntax) transformation, 而在後端是利用 Personalized Comment Decorator 作 view (semantic) transformation. 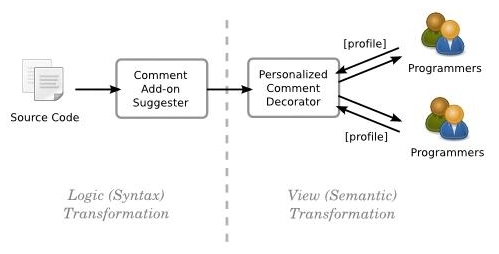 在 Personalized Comment Decorator 的設計上要特別注意不能落入 AI 過去的死胡同, 我們不是要嘗試讓 Personalized Comment Decorator 變成 programmer, 而是要嘗試讓 Personalized Comment Decorator 能夠產生最接近 programmer 想要的結果. Cenqua : The Commentator 並不全然是不可行的, 甚至在 code generation tool 越來越多, programming phase 正在邁向 fully automation 的同時, 這樣的 commentating tool 或許會變成在 maintenance phase 相當關鍵的產品也說不定. This entry was posted on 上午11:24 and is filed under idea , software maintenance , Software Tool . You can follow any responses to this entry through the RSS 2.0 feed. You can leave a response, or trackback from your own site.